Notre Dame is 130 meters long, 48 meters wide, 35 meters high. The rose windows have a diameter of 10 meters. The cathedrals pillars have a diameter of 5 meters. Notre Dame is located on the Paris Island called Ile de la Cite, which concentrated the power attributes of France between the 4th and the 14th century. The world famous cathedral is referred to as: Notre Dame de Paris (“Our Lady of Paris” in French), The Notre Dame Cathedral or sometimes just simple “Notre Dame”. Notre Dame has endured destruction and sunsequent restoration in many periods. However, much of the facade and interior still are true to the original designs. In the 16th century, both the Huguenots and the French king vandalized and changed a lot of the cathedral’s contents. A lot of the features on the cathedral’s exterior were removed because they were considered to be idolatrous, and tombs and stained glass windows were destroyed in the name of modernization. The cathedral was converted into a storage warehouse for food, during the French Revolution, and the heads of many of Notre Dame’s statues were removed. Between 1845 and 1870, a first attempt at restoration took place. A good portion of the previous century’s damage done to the cathedral was repaired, and new additions were built. Most recently, a new restoration program was started in 1991 and has gone on for 20 years with a focus on cleaning up facade’s and sculptures. 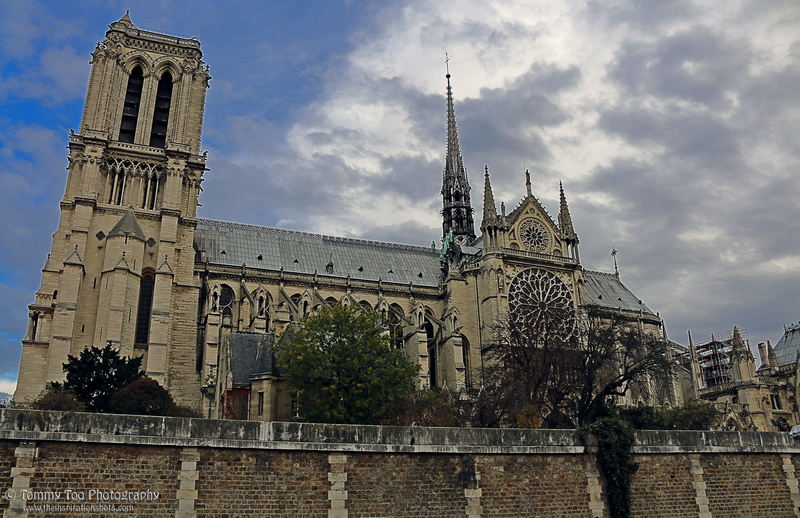 Posted on February 1, 2015, in Photography, Travel and tagged #notredame, #photography, #travel. Bookmark the permalink. 1 Comment.